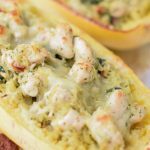 Pesto Chicken Stuffed Spaghetti Squash is a creamy & delicious fall dinner for two packed with protein from chicken breast, Greek yogurt and baby spinach! Plus my favorite combo of pesto & mozzarella cheese! 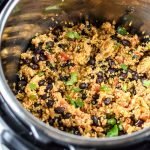 It makes amazing leftovers! Next, there’s me, at home from TJ’s with spaghetti squash. And I realized I’ve never actually cooked spaghetti squash for myself before. I’ve had it, yeah. But I’ve never cut it. And it seemed slightly dangerous. So naturally, I looked it up on YouTube. Thank goodness I found the the most helpful video for cutting spaghetti squash EVER. Obviously, it’s called How To Cut a Spaghetti Squash, by Melissa Joulwan. It seemed safe at first watch, and I still have all of my fingers after cutting multiple spaghetti squash this way, so I think we’re good. You’ll find the insides are pretty much like acorn squash or maybe pumpkin, but less stringy. It’s easy to take a large metal spoon and scrape the seeds/insides out. Make sure to have a good grip on the squash. I speak from experience. I’ve been thinking a lot about pesto lately. Now that we’ve got a food processor, making my own pesto is within the realm of possibility. So I totally did it! 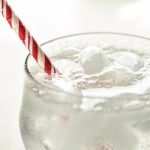 I’m working on a post specifically about that – and comparing prices! (It’s done now!) Long story short, it was pretty good. 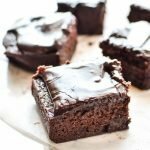 And I used it in this recipe! Costco Pesto is also my favorite, so I’ll have to figure out the price difference. I’ll get back to you on that one. The Greek yogurt, in my opinion, is key to this recipe. It gives you that creamy saucy feel but it’s NOT loaded with cheese (even though I literally love cheese). The pesto blends with it to mask the Greek yogurt tang, and it’s delicious. Plus a little extra protein on top of half a pound of chicken per serving. P.S. I couldn’t help it, and I put some cheese on top. You should too. 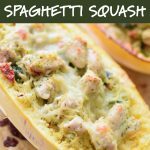 If you’re meal prepping this recipe, it is best to remove the pesto chicken spaghetti from the squash shell for storage. Keep it in a Pyrex in the fridge! Reheating in the microwave totally works (I did it today). 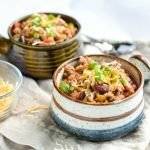 If you’re on your own, this recipe is great for having one half for dinner, and the other half for lunch the following day. Preheat oven to 400 degrees F. Line a cooking sheet with foil. Spray both halves of the squash with non-stick cooking spray. Season with salt and pepper. Place squash halves cut-side down and bake for 30-40 minutes. For easier cutting, use a fork to poke a few holes in a whole squash and microwave for about 4 minutes, then cut in half lengthwise and bake. Bake for 30 minutes. Remove from oven when the skin is easy to puncture with a fork. While the squash is in the oven, begin cooking the the chicken. Heat olive oil over medium-high heat. When hot, add chicken pieces and stir frequently until they are almost cooked through. Add spinach and sun dried tomatoes. Cook chicken, spinach and tomato mixture for another 3-4 minutes, until spinach is cooked down. Place mixture in a large mixing bowl and set aside. When the spaghetti squash is done, let it cool for a couple minutes, then remove the seeds and guts from both sides and discard. Run a fork through the flesh, one side at a time. Long spaghetti-like strings should appear and easily separate from the squash. As the spaghetti flesh is removed, add it to the bowl with the chicken. 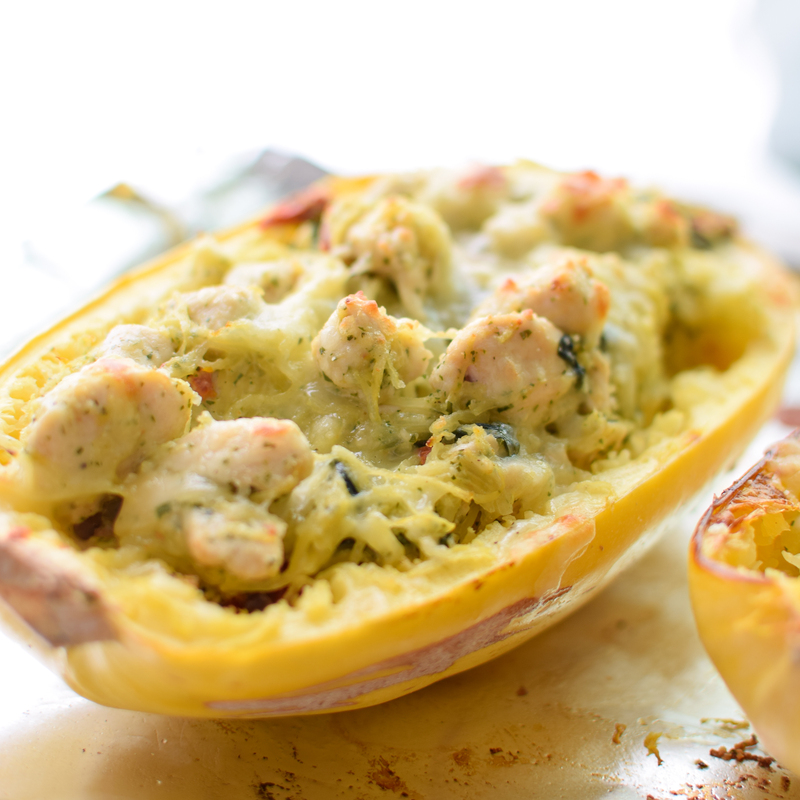 Leave the empty squash shells on the baking sheet for later use. Add pesto and greek yogurt to the squash and chicken mixture. Stir until thoroughly mixed. Divide the chicken squash mixture evenly between both squash shells. Top with mozzarella cheese. Place back in the oven for 8-10 minutes at 400 degrees. Broil 2 minutes for a cheesy golden brown top. Serve in the squash shell, or remove from shell and serve in a bowl. Store leftovers in airtight containers for up to 4 days. 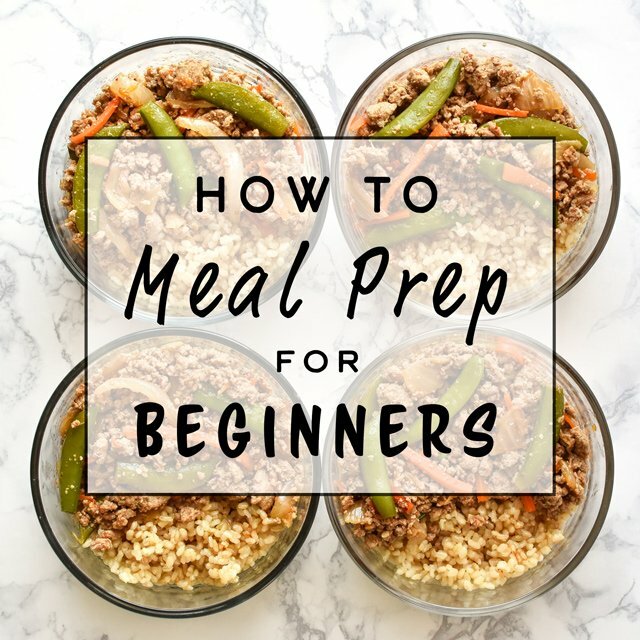 If you are meal prepping this recipe, it is best to remove the pesto chicken spaghetti from the shell for storage. Store in the fridge for up to 4 days. Recipe adapted from Green Chili Chicken Enchilada Stuffed Spaghetti Squash by Danae at Recipe Runner. Nutrition information estimated with My Fitness Pal. Thank you so much for reading! 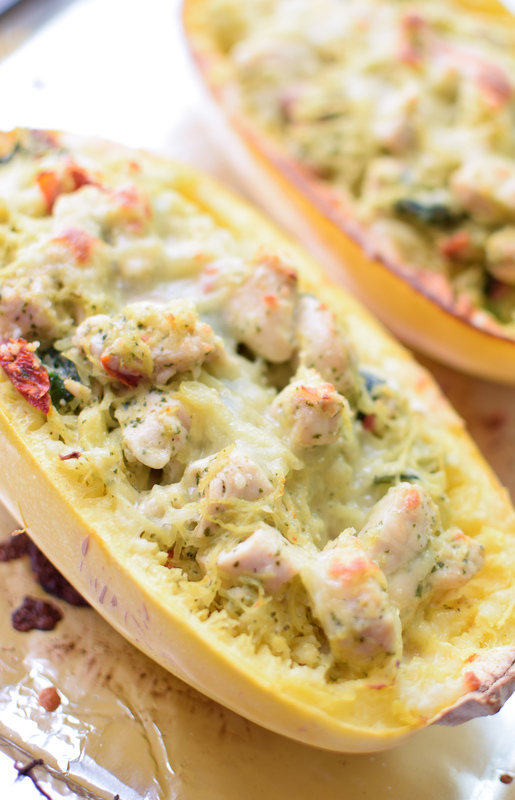 Tag @projectmealplan on social media if you make the Pesto Chicken Stuffed Spaghetti Squash! 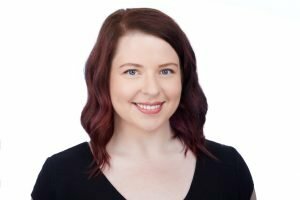 I’d love to see what you’ve created! 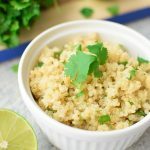 Oh, and follow me on Pinterest for meal inspiration every single day! Hi Kara! I’m so glad you liked it! Thank you so much for letting me know. I really appreciate your comment! Hi Madison! Good question. 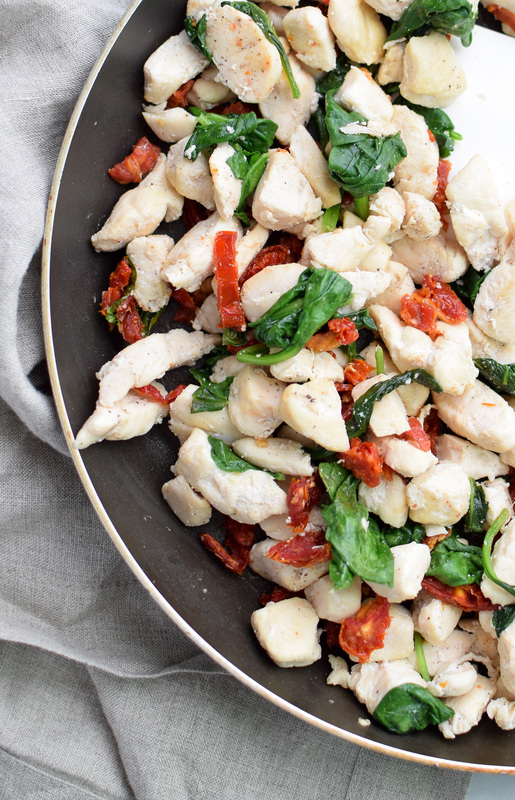 I’ve never made this recipe without chicken, but I’m thinking it would be delicious if you increased the amount of spinach, and maybe added mushrooms to the sauté (when you cook the spinach and sun-dried tomatoes) if that sounds good to you! Anything you might like in a traditional pesto noodle dish would probably be a good substitute 🙂 I hope you like it! Thank you for your kind comment Theresa! I’m so glad you liked it. I’ll have to try it with mushrooms. 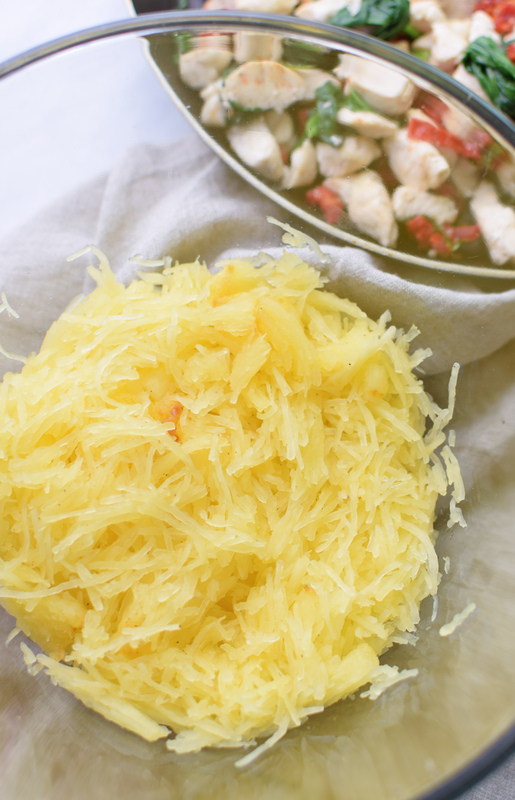 I love spaghetti squash, and I particularly like the combination of flavors you have going on in this dish. 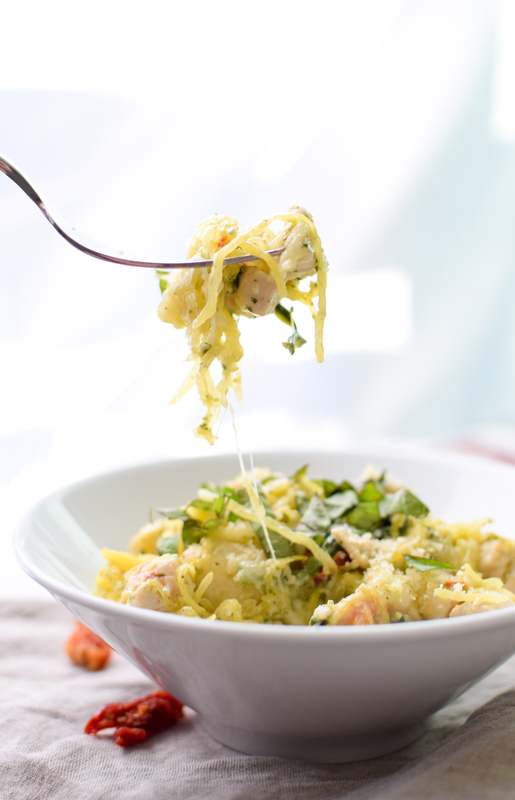 Your pesto chicken sounds delicious and since I love spaghetti squash this would go over very well in my house. By the way., an easy way to cut a spaghetti squash in half is to pierce it where you are going to cut it then put it in microwave for 5-6 minutes. Much easier to cut in half then bake. I’m really looking forward to making this recipe. I’m trying to watch fat and calories…have you ever tried it with 0% plain Greek yogurt? I’d rather add more mozzarella cheese lol! Hey JB! 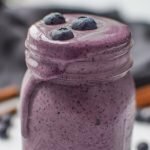 I honestly am not sure if I’ve used 0% Greek yogurt in this recipe, but I’ve definitely swapped it in other similar recipes and can barely tell the difference, if at all. 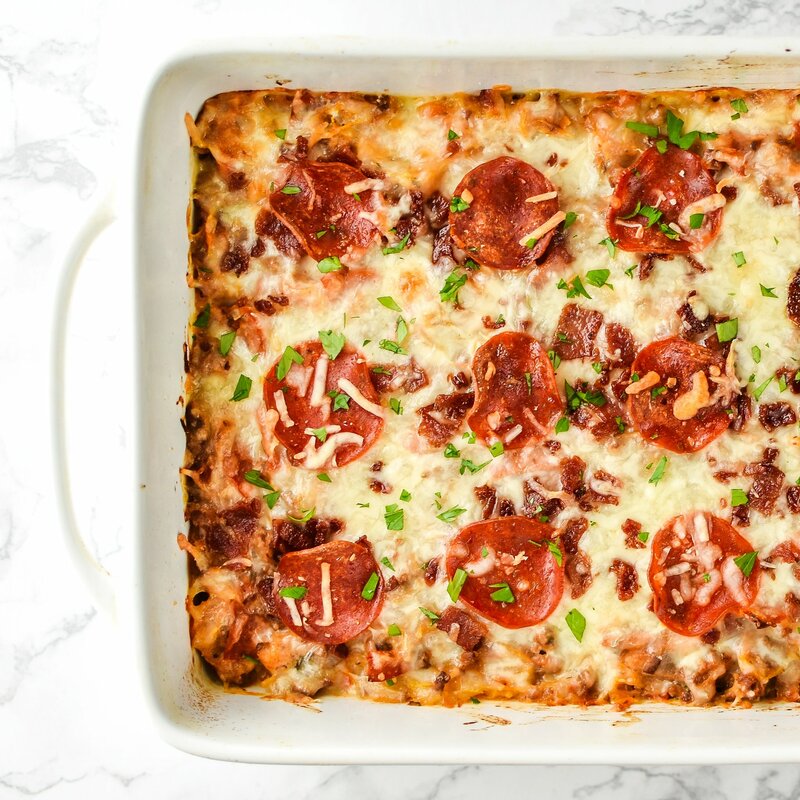 Actually, I just today used 0% in my Meat Lover’s Spaghetti Squash Pizza Casserole and it’s still just as delicious! More cheese is ALWAYS a great idea too! I hope you like it! Thanks for replying! I think I’ll give it a shot, because like you said, I doubt they’ll be much of a difference. I’ll give my review next week…can’t wait to make this! It’s a hit! Left out sun dried tomatoes because both Hubby and I don’t like tomatoes. Maybe I’ll add more spinach and presto next time, but for a first time recipe it’s really good! FYI – 0% plain yogurt worked just fine.